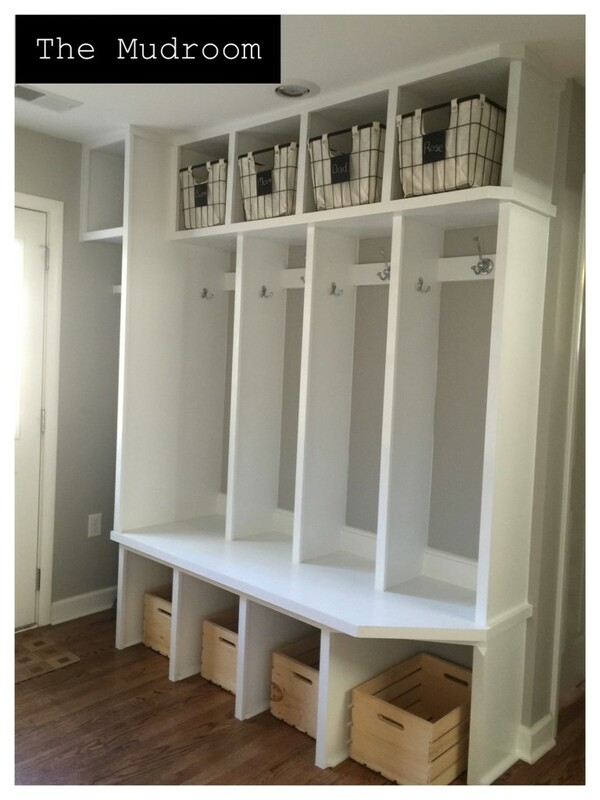 Having an elegant mudroom is not only great for home organization, but for re-sale value, too! A mudroom is a modern mother’s manna from heaven. It’s a must-have in any family home. 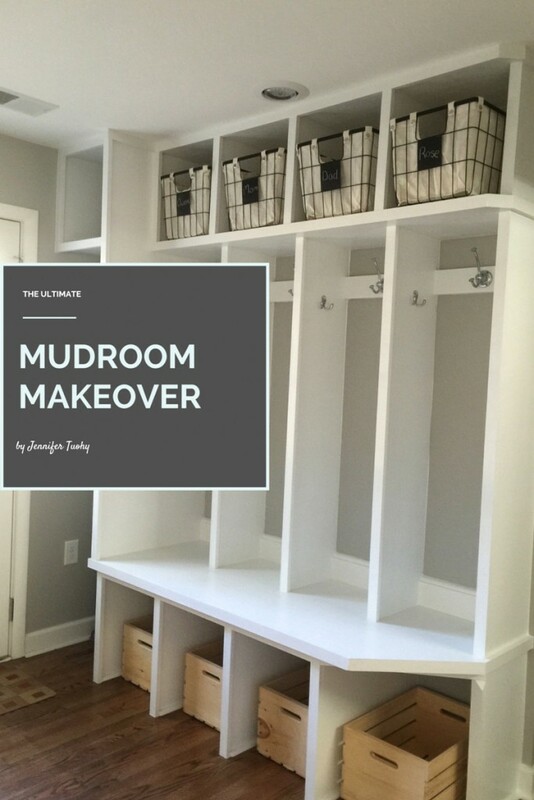 The mudroom is the perfect place to corral all the sports gear, shoes, hats, coats, school bags and soccer bags before they creep into the rest of the house and become clutter. What really makes a mudroom work, however, is storage. From cubbies and lockers to baskets to bins, well-planned, easy-to-access storage is essential for turning a mudroom into a usable entryway and not just a repository for stuff. 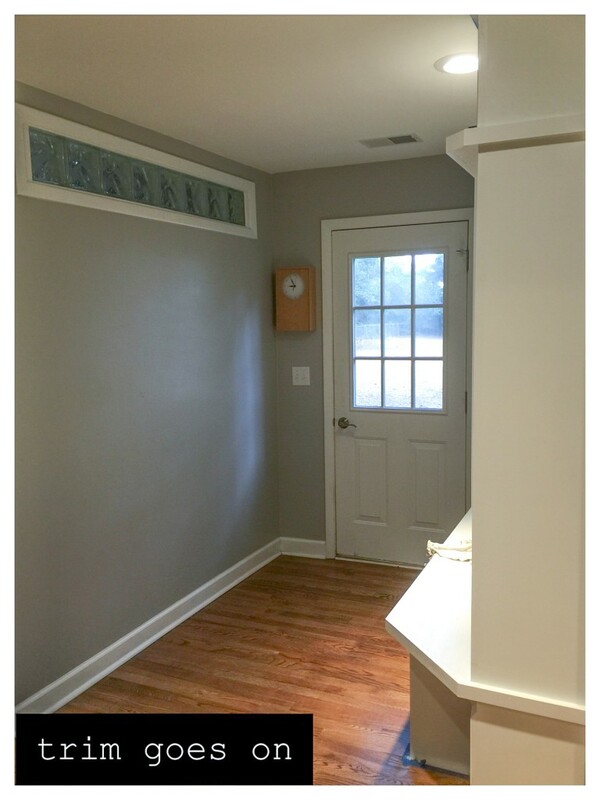 When we remodeled our 1960s home, we added a mudroom and a contiguous laundry room as part of a garage conversion. I can say categorically that it has been one of the best decisions we made during the entire remodel. When we have guests over, it’s always the room they “ooh and ahh” over the most. 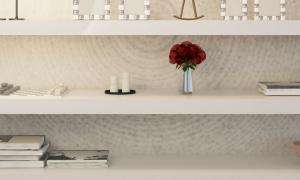 Having a built-in, elegant storage system is a very attractive feature for a home, especially when it comes to resale value. 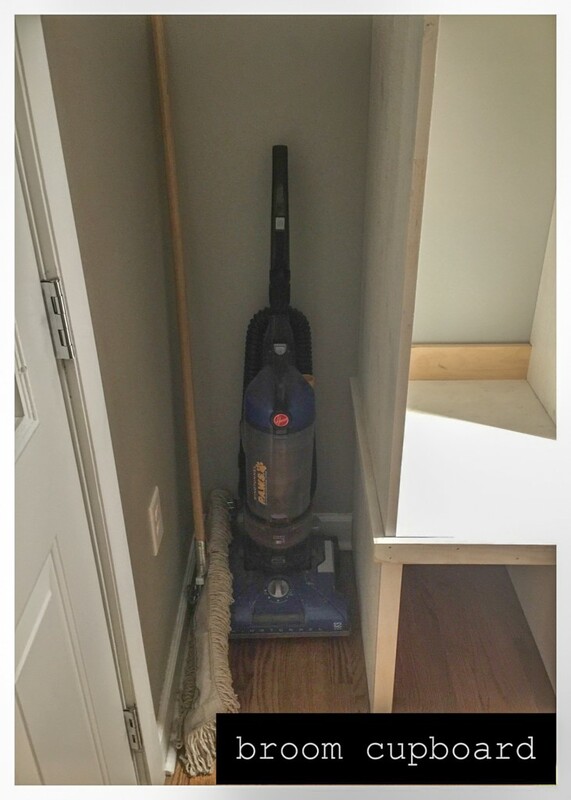 Our mudroom incorporates a built-in locker/cubby storage unit, a broom closet and the laundry room (which we fitted under the stairs and can easily close off courtesy of a pocket door). This set up makes it simple to keep the area clean and tidy, even when it is full of all the many mountains of gear two children, two adults and two dogs create. Plus, having the laundry room next to the mudroom means that really dirty, grimy clothes never make it any further into the home before coming in contact with water and soap! 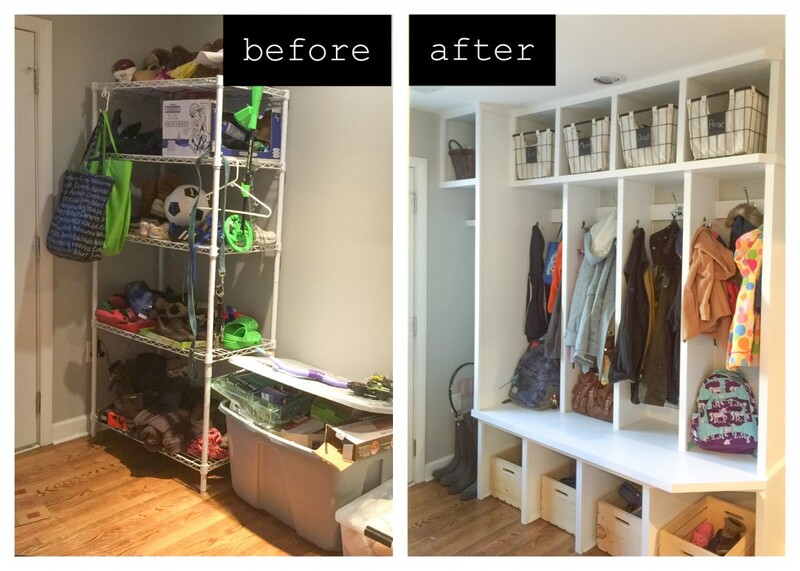 Read on for a look at how we built our mudroom storage system. When we bought our home, it had a large room that had previously been a garage. However, the conversion from garage to room had consisted of putting carpet down over the concrete floor, tacking some panels up on the walls and knocking together a few closets. We enlisted the help of a local contractor to turn the large room into four smaller ones: a master bedroom with a master bath, a laundry room and a rear entryway/mudroom. After the walls went up and the entryway was finished, we began using the space to store our gear and quickly realized that a built-in storage solution was essential. I worked together with our contractor, Christian, to create a locker/cubby combination system that would hang our coats, give us a place to easily put shoes and also provide a higher spot to stash less used but still essential items. After researching dozens of ideas online (which I compiled into this Pinterest board), I came up with a rough plan for him to work from. He decided the easiest way to create what I had envisioned was to build the unit in three separate stages. First was the bench/bottom cubby unit, then the lockers and the top cubbies. 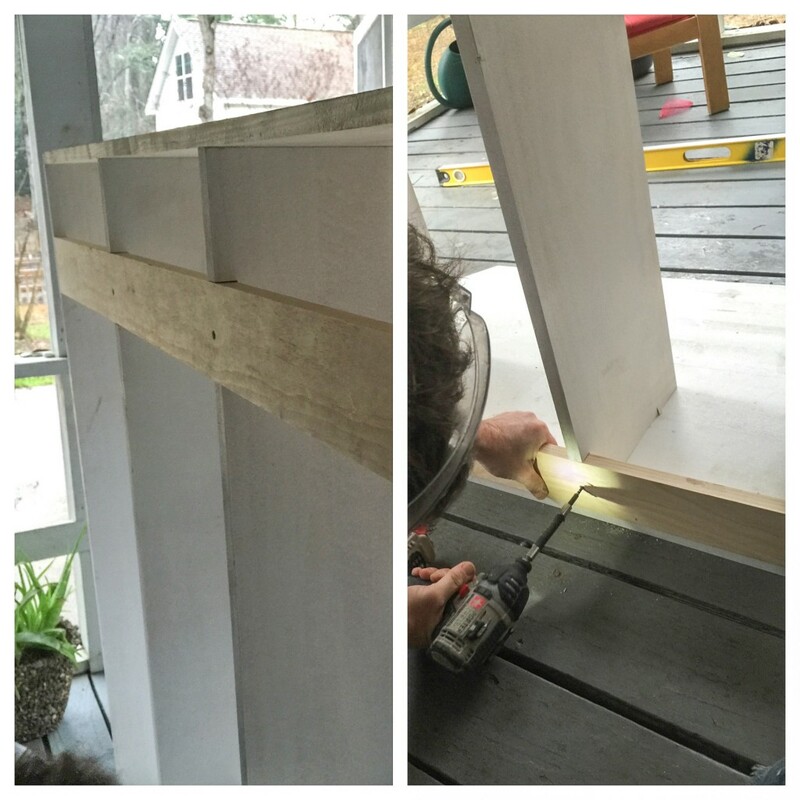 He measured the space to determine how big each cubby would be (we wanted four—one for each member of the family), and constructed a simple bench with three dividers. 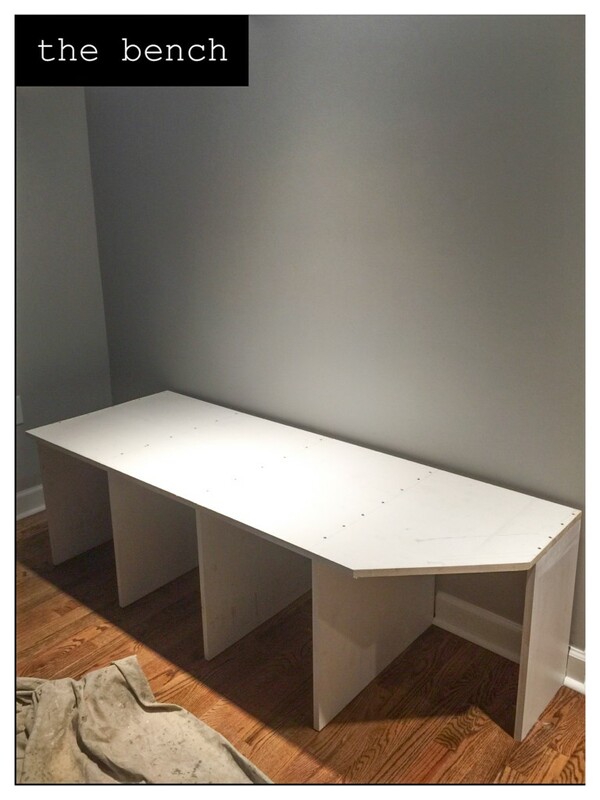 He left an open space at the end for what would become my “broom cupboard.” We opted for a curved outer corner to cut down on the number of bruised knees we might get when walking around it! 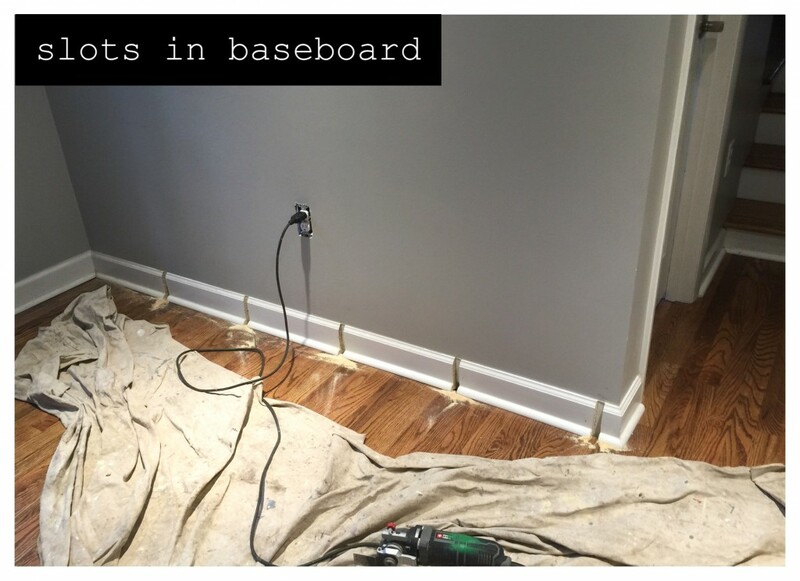 To make the unit “built-in” and provide plenty of strength, Christian cut slots in the baseboard the width of the bench’s dividers and fitted the bench against the wall. He then attached it with screws directly into studs. 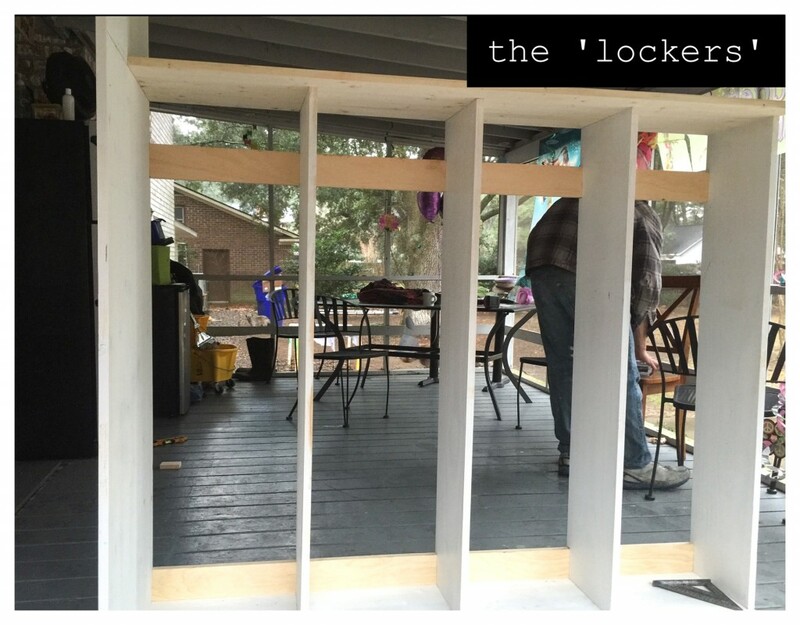 Next, he built the “locker” component, which was a larger version of the bench. It consisted of four long compartments and a top, plus a base and a taller wall on one end, which would form the exterior of our broom cupboard. To provide stability and to give us an area to attach hooks for hanging coats, hats and bags, he inserted two 1 x 4 pieces of wood into notches he’d cut in the back of the locker dividers. 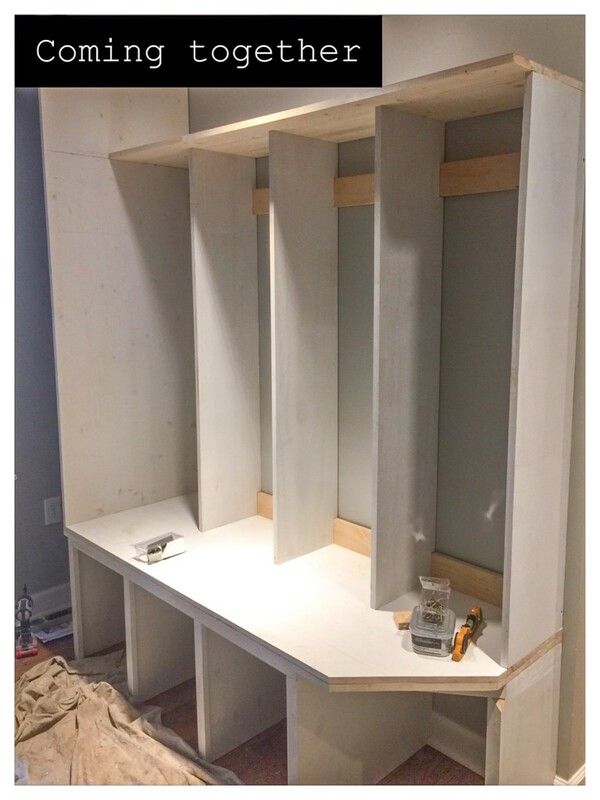 Then, he brought the finished locker unit into the mudroom and placed it on top of the bench, attaching it to the wall with screws drilled directly into the studs. The wall on the far left closed off a small section of the room to give us our broom cupboard/storage area. We contemplated putting a door on this, but as our back door opens into it we decided it would probably get tricky to access, so we left it open. 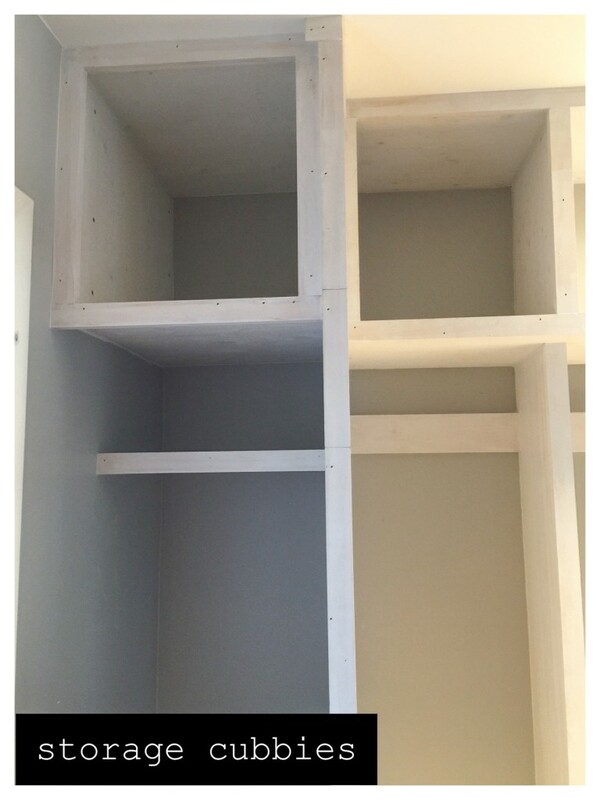 Next, he attached the five cubbies, which he had built as individual boxes, to the top of the lockers and the wall with screws. Now that the structure was in place, he caulked around every joint, further securing the unit to the wall. 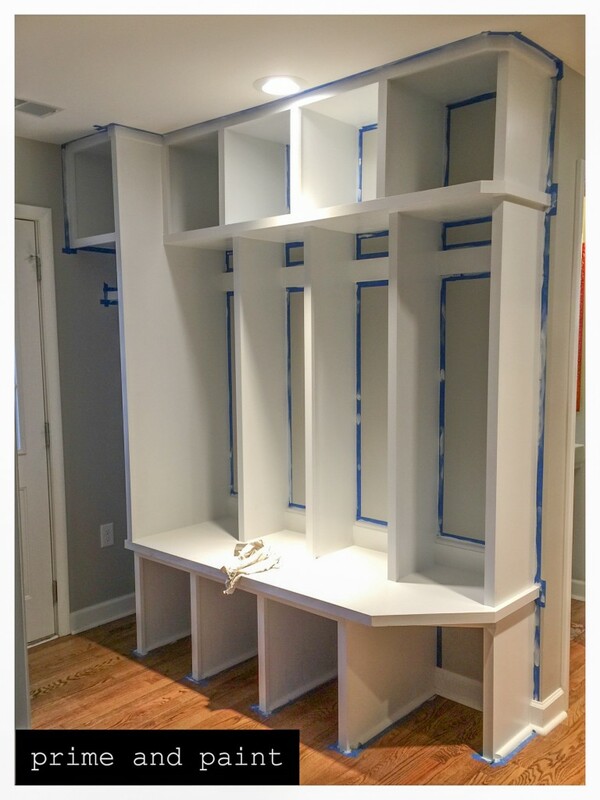 He attached trim pieces to all the exposed shelving sections using a nail gun. He also put quarter round around the base to give it a real built-in look. Then, he used wood putty to fill in all the holes from the nails, and primed and painted the whole unit. Now it was up to me to choose hooks, storage baskets and boxes to ensure everything had its place. 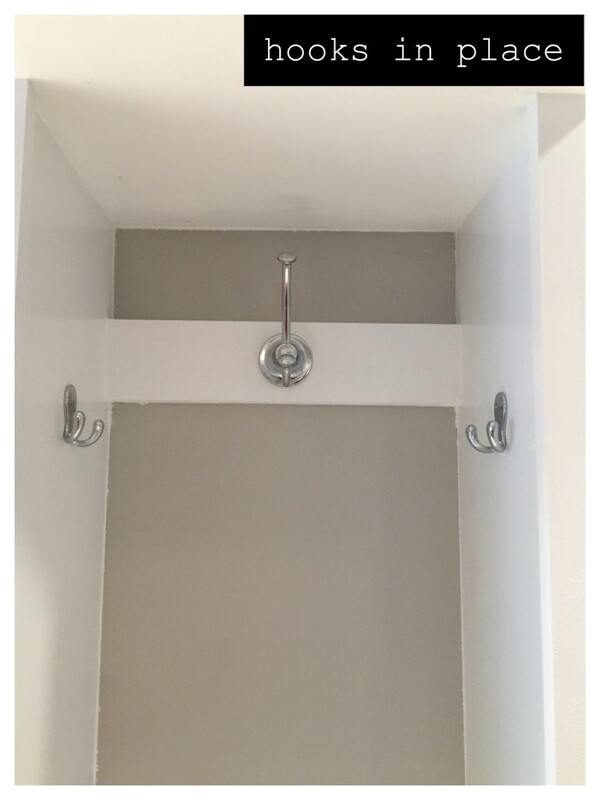 I picked large bathroom robe hooks for the cubbies, alongside two smaller garment hooks, as they were the biggest I could find and we wanted to make sure we could hang as much as possible in the lockers. I selected simple wooden crates for the shoe storage. They were the perfect solution because not only are they sturdy, but the slatted bottom means I can just pick them up, take them outside and shake out any dirt that’s accumulated without having to unload the contents. I then chose some baskets with chalk name plates on them, so we could each have our own designated cubby. The built-in storage unit in our mudroom has become the hub of our home. We use the bench to sit on while putting shoes, coats and hats on before we walk out the door. We unload all our gear straight into it when we come home, making it much easier to find what we need when we go back later to look for it! When I find random things around the house that belong to certain members of the family, it goes straight into their cubby. That way, they know where to find it when they go looking for it. This alone has saved us countless hours of futile searching. It truly is the ultimate family organizer and we are so pleased we invested in adding one to our home. Jennifer Tuohy writes about the extensive renovation projects she’s pursuing at her Charleston, South Carolina, home. 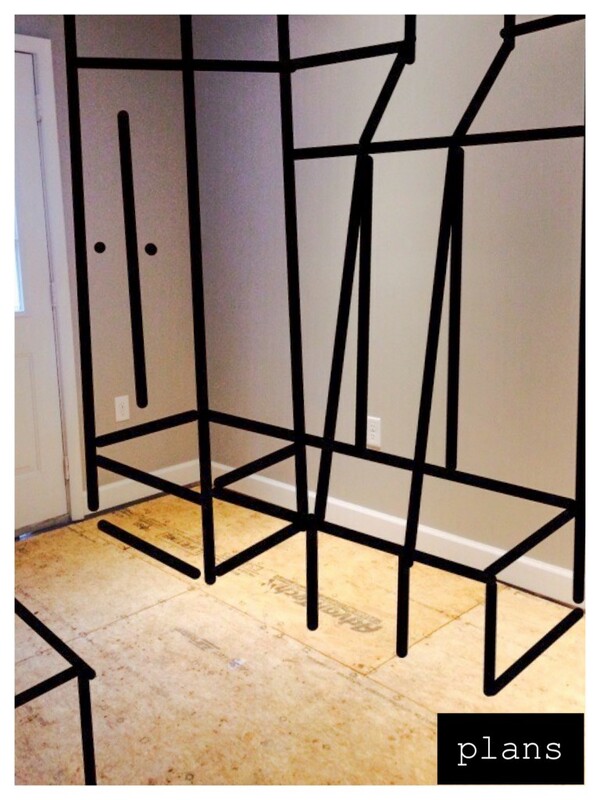 Jennifer writes updates on her storage refinements and restorations for The Home Depot. If you are looking to research storage ideas for your own space, you can visit Home Depot’s website. Alexandra is the Manager of Social Media & Content for Coldwell Banker Real Estate, LLC. She lives in Hoboken, NJ and loves taking advantage of the many local perks (read: dogs EVERYWHERE) and proximity to Manhattan. Her idea of relaxing is perusing the aisles of Sephora and proofreading copy. No, really. HomeAdvisor shares their best laundry room renovation tips to spruce up your work space. If you find yourself drowning in piles of clothes and surrounded by belongings, you’re not alone. Here are eight simple tricks to save space and maximize storage in a small bedroom.